This story was updated at 6:36 p.m. ET. An American astronaut getting ready to ride a Russian Soyuzspacecraft home early Friday said she's excited for what's rumored to be apretty wild ride. "I've heard it described as a train wreck followed by acar crash followed by falling off your bike," NASA astronaut TracyCaldwell Dyson said in aprelanding video. "But honestly I think that's just folks trying tofind a bit of humor in a hardlanding, which I understand the Soyuz is." Caldwell Dyson is wrapping up a nearly six-month stay on theInternationalSpace Station. She will depart the station tonight (Sept. 22) with two ofher crewmates: Russians Alexander Skvortsov and Mikhail Kornienko. Thespaceflyers boarded their Soyuz TMA-18 spacecraft on Thursday and closed thehatches between it and the space station at 6:35 p.m. EDT (2235 GMT). The trio is slated to land on the steppes of Kazakhstan inCentral Asia tomorrow at about 12:55 a.m. EDT (0455 GMT). It will be Caldwell Dyson's first journey down to Earthaboard the Soyuz, which is said to be a somewhat rougher landing compared withthe long glide and runway landing of a NASA space shuttle. Just before touchdown, the Soyuz fires a set of retrorocketsto slow its landing even more before coming to a jarring stop on the ground.Sometimes, the capsules can tip on their sides after landing. "I've heard so many stories from people describing whatlanding is like and all I can say is, I'm going to expect this to be Mr. Toad'sWild Ride for me," Caldwell Dyson said in the NASA video she recorded onthe station. 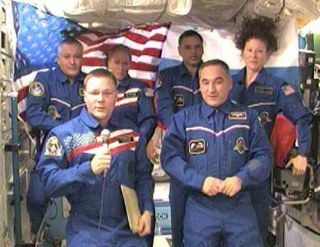 She recalled a conversation she had with NASA astronautMichael Foale, a veteran Soyuz rider, right before she launched on her mission. "It was a very interesting conversation, as we talked about,'Yeah, at this point you're going to hear a bang and then you're going to feelthis jolt and then you're going to kind of smell this interesting odor as theoblation material starts to burn off,'" Caldwell Dyson said. "Andanybody sitting outside this conversation would have thought we were mad." The departing spaceflyers are slated to undock from thestation Thursday at 9:35 p.m. EDT (0135 GMT Friday). Caldwell Dyson said leaving the station would bebittersweet, but she was mostly excited to experience a Soyuzlanding for the first time. "That level of anticipation is really just provided tome by my fellow crewmates who have gone before me, and so I hang on to theirdescriptions and I look forward to experiencing this, to a large degree,"she said. "There's a small degree of me that says, 'you know there aresome key things, make sure your straps are tight, you've got your head back andyour tongue is not between your teeth when you land.'" NASA will broadcast the upcoming Soyuz spacecraftundocking and landing live onNASA TV, beginning at 5:45 p.m. ET. Undocking and landing coverage beginsat 9:15 p.m. ET (0115 Sept. 24 GMT). Clickhere live space station mission updates and a link to NASA TV.